Fryeburg Interact Club and Fryeburg Academy need your help . Join the Fryebug Area Rotary Club, The Interact Club and the Academy to show WGME-13 our community support and School Spirit. Wear your School Colors and bring some food or cash donations ... for every dollar donated, the food bank can purchase 5lbs of food for distribution !!!! The school spirit challenge is a friendly competition between schools to show school pride and spirit, all while helping the community. The program is designed to promote the community and good stewardship with students of high schools in Central and Southern Maine through an ongoing food drive to benefit the Good Shepherd Food Bank. 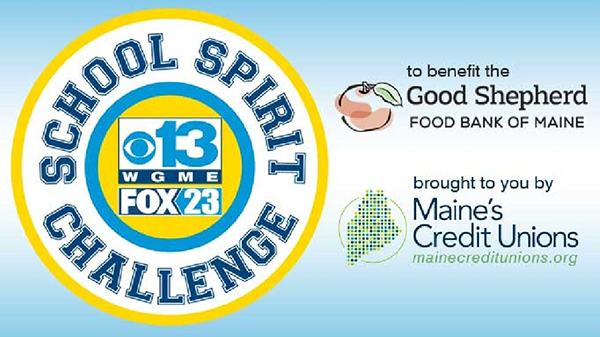 The School Spirit Challenge is sponsored by Maine's Credit Unions. The SSC is all about showing off everything that makes your school a great place to be by demonstrating why you have the best school and the most community spirit. Schools will compete to raise the most pounds of food this winter. CBS 13 News and FOX23 will feature a different school every Friday on Good Day Maine from January 6 to March 3. The finale will be held on March 10. The winner of the School Spirit Challenge wins the coveted Spirit Cup Trophy.